Acucraft’s goal is to revolutionize the fireplace industry through excellent customer service, and unique custom solutions with a Collaborative Design Concept (CDC). Working directly with our customers to fully identify the vision and concept while incorporating Acucraft’s proven designs to create the absolute best finished product. 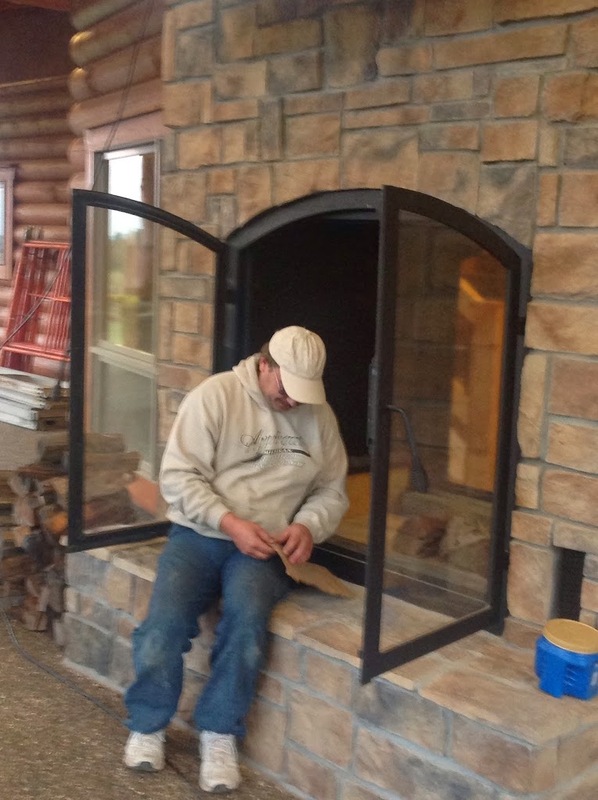 This Custom See Through Outdoor Indoor Wood Burning Fireplace was designed for a log home being built in Indiana. 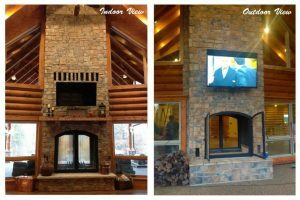 The customer was looking for a fireplace to be enjoyed in their large great room, and outside on their patio. The design requirements were to obtain a large viewing area with a rustic feel. 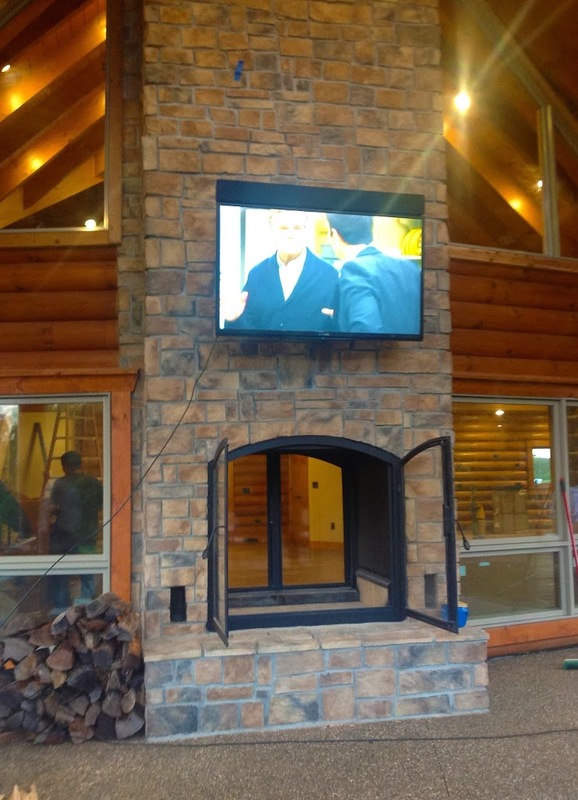 Additionally, the customer wanted to enjoy a television above the mantel in the great room and outside area. Acucraft was thrilled to receive the opportunity to design this beautiful, one of kind and unique fireplace. With the requirements of the fireplace at hand, the Acucraft design team began to work directly with the customer to go over the options Acucraft has to offer. Once Acucraft’s Design Team and the customer went through the Collaborative Design Process, a design was presented with a viewing area of 46”x 42”. The design needed to include the 22 key ratios for all Acucraft see through fireplace, ensuring the correct flue diameter and length and combustion air inlet options required to fulfill the desired viewing requirements. Copper Patina, a rich dark textured finish, giving your fireplace a truly vintage appearance. 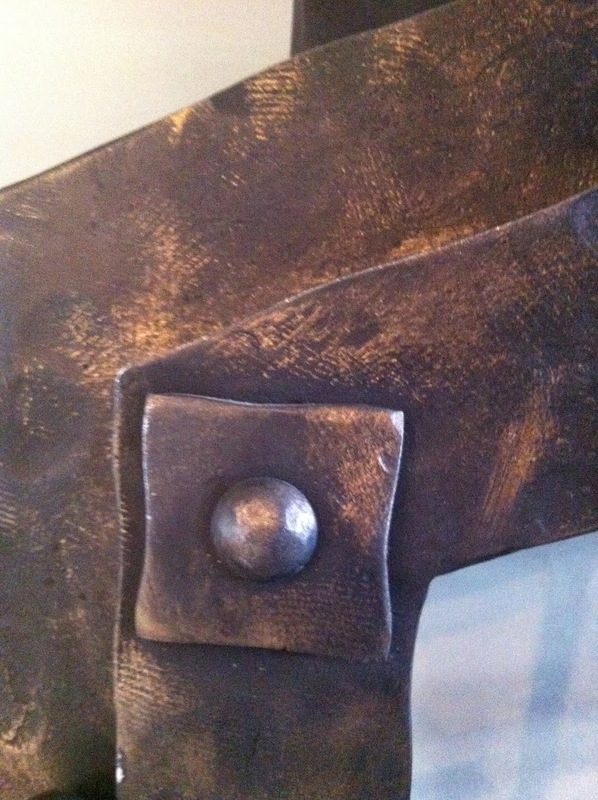 Aged Bronze Patina, a rich, smooth finish, giving your fireplace a truly rustic appearance. Japanese Brown Patina, a 300 year old recipe originally used for Japanese tea pots. Black, a deep matte, black finish giving your fireplace a clean and classic appearance. 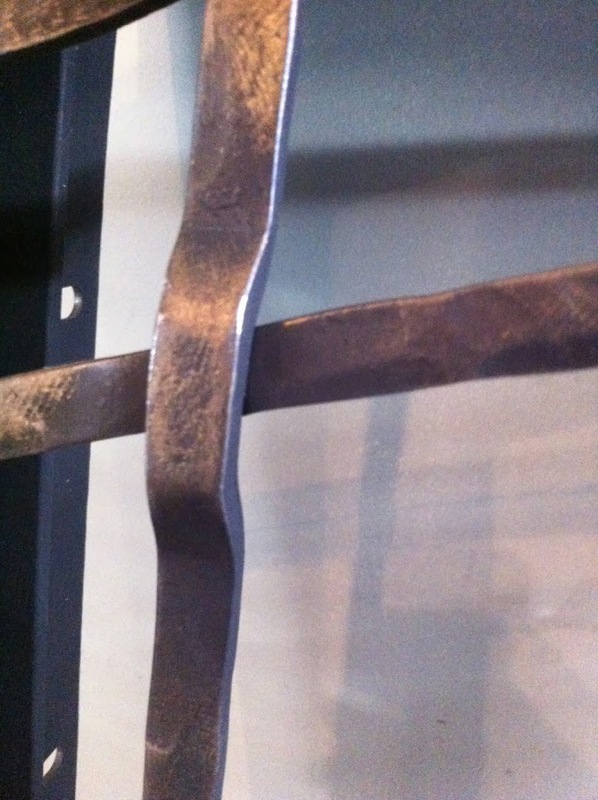 The client selected a custom Patina with a wash between a Copper and Aged Bronze finish with custom hammered front and doors with crossover strapping and round head clavos is order to achieve the rustic look. 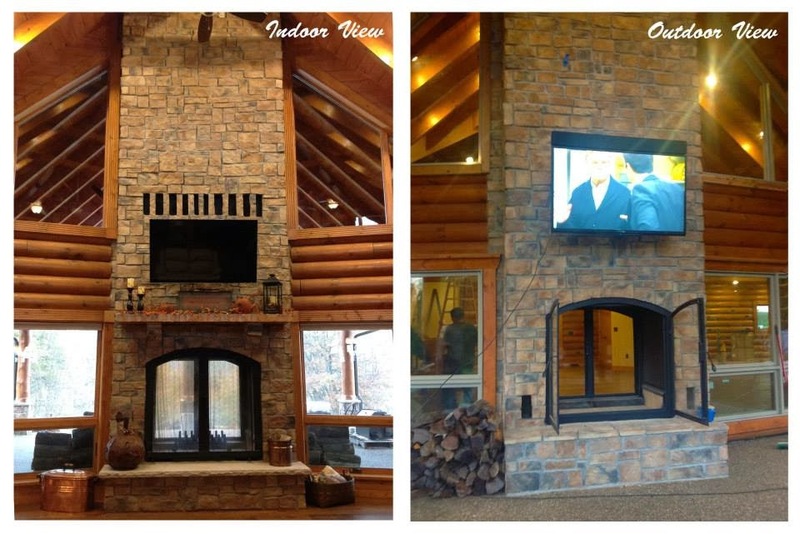 The Custom Indoor Outdoor See Through Wood Burning Fireplace uses 100% outdoor air for combustion. 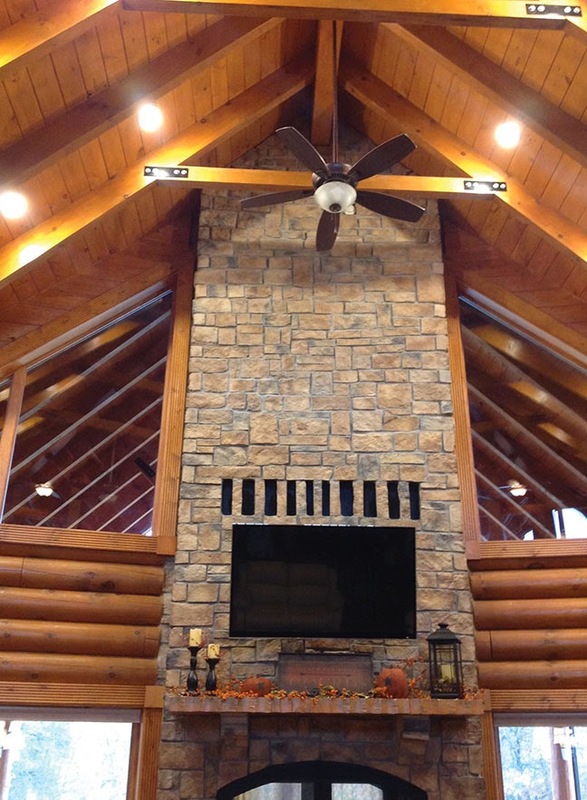 The room air that is heated comes from below and goes around the fireplace to heat the home. The customer wanted the venting above the mounted television, which is the opening between the stones where the heat comes out. In order to eliminate any cold spots the customer installed ceiling fans to blow the heat downward. In order to have the venting above the television Acucraft installed a Remote Ducting System, which is part of Acucraft’s Whole Home Heating System (please view previous blog to read more about Whole Home Heating System). The Neo-Ceramic glass panes can support any thermal shock such as cold water on your fireplace door. 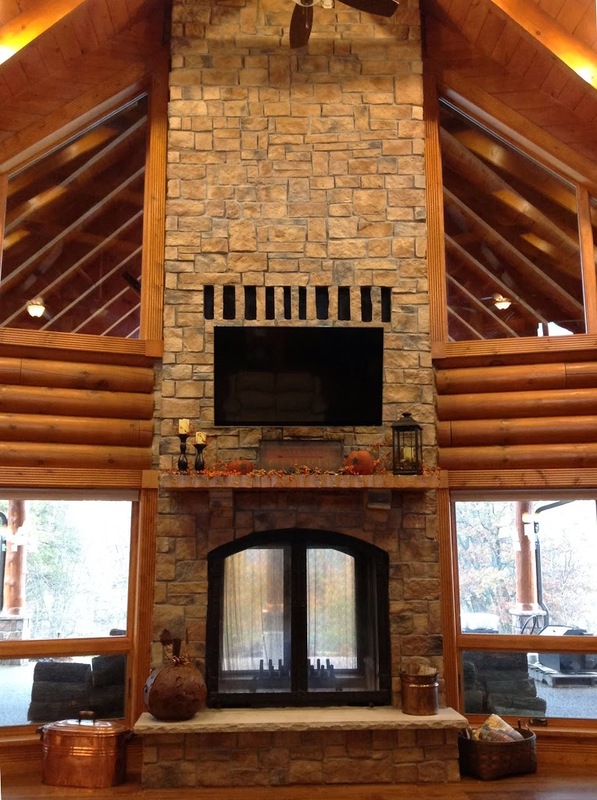 Please contact an Acucraft Fireplace Selection Specialist member today to discuss design options at 855-349-0721 or click here to visit our website for more information.